In 1996, during the preliminary stages of a conservation programme at Narberth Castle, two graves were noticed exposed at the top of a steep slope overlooking neighbouring gardens. As it was planned to erect a large fence along the crest of the slope as part of the conservation programme, small-scale excavations were undertaken in 2001 in order to examine the two burials and to ascertain if they were part of a larger cemetery. In excess of 20 east - west aligned burials were discovered, clearly part of a larger cemetery. Inter-cutting of the graves suggests that the cemetery was in use for a considerable period of time. 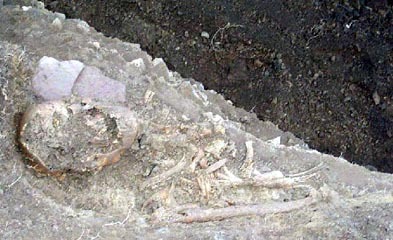 Pottery and a single radiocarbon date demonstrate a late 12th century - 13th century date for the burials. It is possible that the cemetery indicates the former location of Narberth parish church prior to its establishment on its current site 180m to the west, perhaps in the mid 13th century when the castle was rebuilt in stone. The work was funded by PLANED - Pembrokeshire Local Action Network for Enterprise and Development.